Michelle !! I want to thank you for the amazing sleep support you have provided me during the last week .. I was in despair seeing how my boy was falling into a bad habit for bed time where I had a few days with no sleep and a very painful back pain. As he needed me next to him . 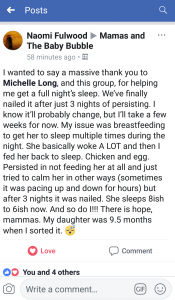 Michelle has been absolutely brilliant in helping my daughter sleep through the night. She helped me out immediately with a very clear sleep plan and has been always on the other end of the phone or email since with support and advice. I highly recommend her! I just wanted to share my experience with Michelle. My lb had not slept well since having tonsillitis at 7 months old. 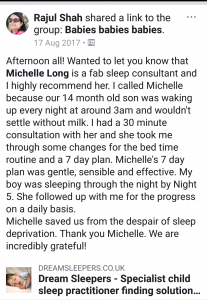 At 9 months we were seriously sleep deprived, trying to sell our house and prepare for moving on little or no sleep so i went through couple of sleep consultants websites and found Michelle’s. 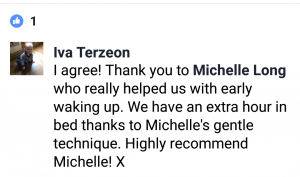 I had a 15 minute free consultation over the phone with her to discuss my lb’s sleeping pattern (not that there was one) and from speaking to her i felt so comfortable and she was great in calming me so I understood what things could have impacted him so i took the 30 min call package with her with a 7-10 day plan to use, and it could be used as well when we moved house. 2 months on my lb sleeps great most nights despite being disrupted due to moving house (our new house isn’t ready yet) and sleeps usually 7:30pm-4:30am (wakes for a bottle) then he sleeps on till 7:30/8am where when we go into him he is usually lying in his cot chattering away to himself. She is a great person, so nice and helpful with full understanding of how even the smallest thing can cause disruption, what developmental leaps can impact as well as giving a sleep plan you can use whenever required. She also looks into the nutritional and behavioural things that can impact sleeping so you know you aren’t failing or loosing your mind and are feeling calm and confident once your consultation is done. Evening all! Just wanted to let you know that Michelle Long is a fab sleep trainer and I highly recommend! We called Michelle because our 2.5 yr old son started waking up several times in the night and was difficult to settle. Michelle’s 10 day plan was gentle, sensible and effective. Plus the 4 hours of support over phone was fab. Michelle really knows what she’s talking about and she has literally saved us from the despair of sleep deprivation. Thank you Michelle. We are incredibly grateful! 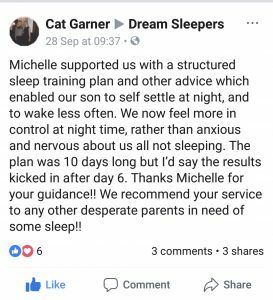 Hi guys, I just wanted to let you know about my experience working with Michelle Long at Dream Sleepers who I know regularly posts on here. I was in a desperate situation a couple of weeks ago as my daughter was up for hours at a time during the night, needless to say myself and my partner were on the brink of insanity… Michelle created a package based on our situation and our daughters behaviour and unbelievably it worked from night one. With some tweaks to the night time routine she falls to sleep in minutes at night and is able to self settle if she does wake. Last night (day 13) was the only night I had to go in and settle her which I think was related to teething. I’m flabbergasted to be honest as I thought it’d be more of a slog than it was. I like the fact that Michelle is a qualified health professional too as it gives security to know that the advice she gives takes into account babies needs and wellbeing.